So there ya have it, she's been too crazy busy/overbooked/but blissfuly happy to build new baskets for 2007 any earlier! But all is not lost, we had the most beautiful fall in memory and the view from my window says that winter is not yet ready to drop the curtain....so there must still be time! ...and yes, it's on my side! 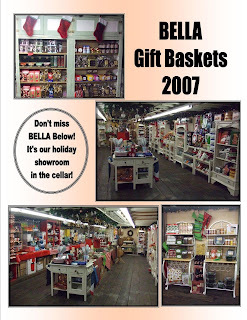 The catalog will be linked to the website BellaBakerCity.com by the end of the week, or send us an e-mail and well send it along to you directly! Oh! It is really a great and so informative article.